This is only the beginning — a theme on the lips of many of the speakers at the ribbon cutting for the new biomass boiler project April 6. 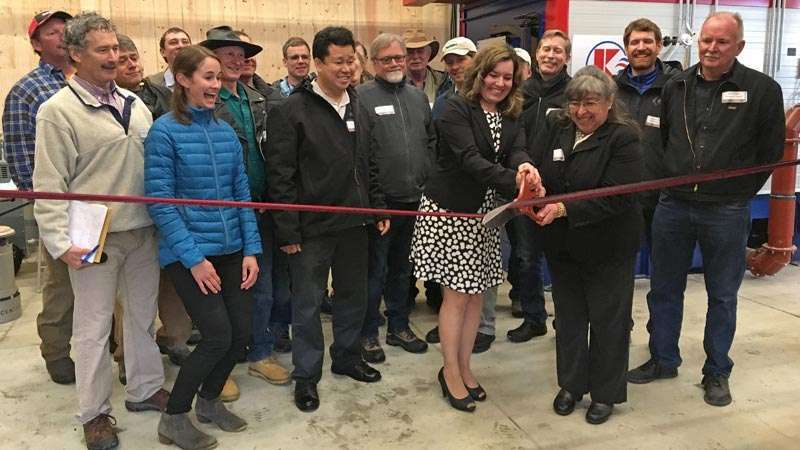 The torrential downpour on Friday afternoon could not put a damper on the excitement of the staff of Sierra Institute, especially biomass project leader Camille Swezy, as she greeted community members and forestry employees for the welcome and ribbon cutting for the brand new biomass project, which will provide both heat and fuel for the county building in Quincy. Swezy, and later Sierra Institute Director Jonathan Kusel, emphasized the project was one of cooperation and financial support between various entities: their own nonprofit, the California Energy Commission, Plumas National Forest and the Sierra Nevada Conservancy, among others. The project began from the Obama-era American Recovery and Reinvestment Act, as one of many economic recovery plans of the early administration in 2010. Plumas County Supervisor Lori Simpson was on hand to speak and remind the audience that this building, completed in 2018, actually began in planning eight years ago. Simpson spoke of the inefficiencies of the public building — and finding out that it had gotten so cold that employees in the building frequently used space heaters. The biomass boiler will bring down the cost for the county to manage the building by a projected $40,000 a year. Simpson was lauded by Kusel as having been an instrumental party — by lending board support — in getting the project off the ground. California Energy Commission Energy Generation Research Office Manager Aleecia Gutierrez came from Sacramento exclaiming that the project had been perfect for her office to support because of the locally sourced materials as a shining example of what could be replicated in other parts of California for small-scale energy efficiency. Jim Branham from the Sierra Nevada Conservancy spoke of how his state agency saw the project as interconnecting various aspects of what is needed: addressing wildfire, producing energy locally, and promoting healthy forest and watershed. “We’re all in this together and Plumas County is ahead of the curve,” Branham said. He did comment that he’d like to see projects like this in the future be more completely local — aspects of design were done with a company in Tennessee. His agency wants to continue to promote projects like this throughout the state. Questions from the audience after the ribbon cutting zeroed in on both how it will operate and who it will benefit. Andrew Haden of High Sierra CFDC took most of the questions from the audience, explaining how the boiler operates and its capacity for use — with an emphasis on the biomass boiler being a demonstration project that has possibilities for expansion into other projects — such as building more biomass boilers for fuel and heating in other parts of the county, and having a future wood product facility run by Sierra Institute in Crescent Mills become an integral part of the operations. The boiler is capable of receiving both wet and dry forest products and relies on that waste and not construction waste. Haden informed the crowd that the system as built is largely automated and will not need a full-time employee. He hopes the project creates a market and reiterated that as the project moves forward there is still much to be determined. Kusel was quick to point out that “close to a million dollars” was spent in the community during the process of building the biomass project. Local contractors from Plumas County were used throughout the project. The ribbon cutting included a lunch served by Sierra Institute and a policy planning talk. $ 3,000,000 to make $40,000 of heat\power a year, that’s a seventy five year pay off. What a joke the BOS has become, ugh. I think this is a great project. It makes use of already existing waste products (woody biomass) that are being collected and burned in the open causing air pollution. The cost to build it should also be weighed against the ability to reduce fire hazard. $3 million is paltry next to the financial damages caused by high severity wildfire. Congrats on pulling off such a complicated project. As we add more wind and solar we also need more dispatchable energy (natural gas, biomass, or storage) for when the sun doesn’t shine and the wind doesn’t blow. There are, by far, the most co-benefits with forest-based biomass. The coalition of partners who agree on this point in rural communities should attest to these multiple benefits.